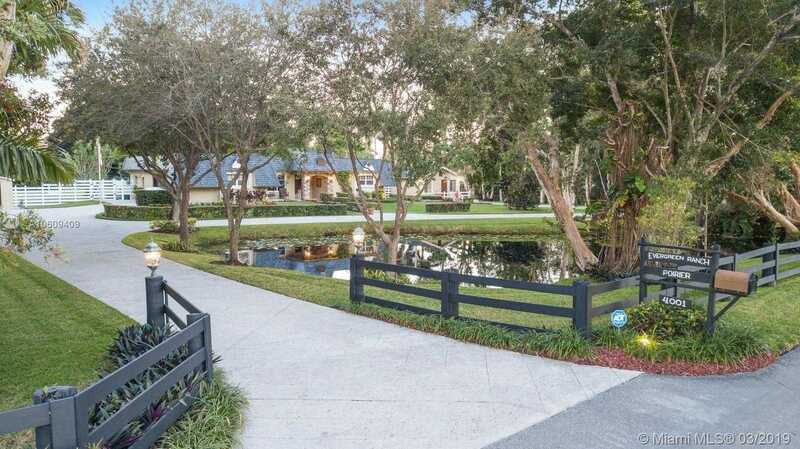 Timeless Charm & Elegance nestled on 2.5 acres for the discriminating buyer looking for the privacy of the ranches, convenience of the city and easy access to MIA & FTL. This meticulously maintained property features traditional style slate roof, copper & stone accents and exquisite detailing thru-out. Main house centers around an airy open concept flr plan perfect for entertaining & features 3 bedrms/2.5 baths/2.5 car gar. Property includes a separate 1/1 Cottage perfect for guests, parents, private office etc.. 2.5 acre lot w/ large pond, 450 x2019; of driveway, pristine landscaping w/ automated LED lighting & irrigation. Out back rests a beautiful multilevel back patio with mature tree, lighting & sound systems & a large slab for RV, boat storage or future stalls. Bring your horses! Please, send me more information on this property: MLS# A10609409 – $849,900 – 4001 Sw 130th Ave, Miramar, FL 33027.